Metric Capital Partners LLP and its affiliates (“Metric Capital”) advise and provide capital solutions to pan-European companies. We seek to support our partner’s ambitions to execute strategic transactions. In addition to providing capital solutions, we aim to be value-add partners to our portfolio companies. We have the flexibility to provide capital solutions across the capital structure, including senior debt, subordinated debt, convertible instruments, preferred and/or common equity. Metric Capital supports investments through diligent board participation to optimize the performance of our portfolio companies. Metric Capital provides strategic and operational support, financial rigor, and network advantages to all our investments. Our flexible approach to assessing and managing our investments allows us to execute opportunities throughout the investment cycle. We work closely with the companies in which we invest in. We work in partnership with management teams on strategic decisions to ensure that our businesses have the optimal capital structure in order to execute their strategic plans. We aim to provide flexible solutions to our partners. We marry the ambitions of our partners and that of our investors through sophisticated structuring. We have a disciplined decision-making and governance process, yet we are capable of fast decisions and clear communication to our counterparties. We aim to achieve our target returns through fundamental credit analysis and adding value to our portfolio companies by continuously supporting their management teams. Metric Capital works in partnership with corporates to support them by executing strategic transactions through the provision of fresh capital (e.g. 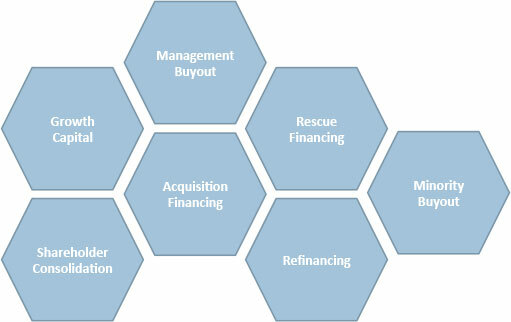 buy-out, acquisitions). Equally, we are willing to refinance existing debt, where the debt has matured and existing lenders are not in a position to provide further financing, as well as providing new capital to companies facing temporary liquidity challenges. Through our secondary investment activities we seek to replace incumbent investors in existing positions, working with both existing lenders and shareholders as well as corporates to determine the appropriateness of Metric Capital stepping into existing positions. Our team benefits from a deep and extensive network with a large number of banks, structured credit vehicles, hedge funds and other market participants.